The planet Venus is the second nearest to the Sun, one of the four "terrestrial" planets that make up the inner solar system. It is also second largest of these four, Earth being the largest. There is only some 650 miles difference between their diameters. As you can see, it appears completely featureless, due to its being cloaked in dense clouds of sulphur dioxide and sulphuric acid. These clouds are highly reflective of light, resulting in the planet Venus being one of the brightest objects in the night sky, especially so around dawn and dusk. As a result, the planet Venus is often referred to as both "morning star" and "evening star". The planet Venus orbits the Sun at a distance of just over 67,232,000 miles. This orbit is almost perfectly circular and one takes 224.7 Earth days. The planet rotates on its axis the opposite way to nearly all the other planets (possibly as a result of a huge collision with something else in the distant past) and one day on Venus lasts 243 Earth days. So, we have the strange situation of a day being longer than a year! Its weight, at around 5,000 million million million tons, is about four-fifths of that of Earth. It shares many of Earth's characteristics, as well as size and weight. It has similar gravity and interior composition. This led to early speculation of whether, beneath the clouds, there would be a planet surface that could support life. Because of the dense clouds, plus an equally dense atmosphere of carbon dioxide, the planet Venus experiences a powerful "greenhouse" effect, where heat is trapped within the atmosphere. This results in a surface temperature of 462 degrees celsius, making it, by far, the hottest planet in the solar system. This dense atmosphere also creates an atmospheric pressure at the surface some 92 times greater than Earth's. It is assumed that the planet Venus, being a rock-based world, has the customary interior layers of crust, mantle and core. There are several unknowns about these, however. The crust is estimated as being some 30 miles thick and is composed of silicate compounds. The mantle, on the other hand, is of unknown composition and is some 1,900 miles thick. The core is assumed to consist of heavy metallic elements such as iron and nickel, reaching halfway out from the centre of the planet. Despite the fact that it is thought to be electrically conductive and the planet has rotation, two of the requirements for creating a magnetic field, the planet, as observed by the probe Pioneer in the late 1970s, has no magnetic field to speak of. This suggests that the third requirement, that of the core being conductive of heat, is not present. 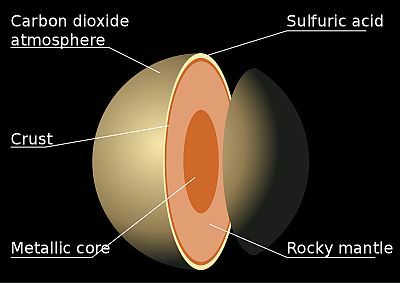 A possible reason for this is that the planet possesses no inner core and that it is not cooling, due to the absence of tectonic plates on the surface, whereby heat can escape. It is thought that, every few hundred million years, Venus experiences a phenomenon known as "global resurfacing". 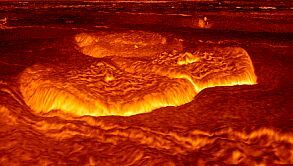 On Earth, for example, lava from the interior can be released at the surface through tectonic plates, forming volcanoes. As Venus has no tectonic plates, the pressure builds up over the millennia, until it eventually bursts through to the surface, covering the whole planet in one go. As this cools, it effectively produces a brand new surface. 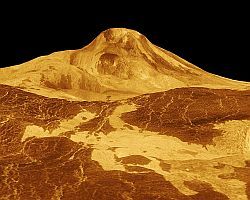 Since the early 1960s, there have been several space probes that have approached the planet Venus and revealed more and more details about its hidden surface. The most recent, named Magellan, managed to use radar to create images of the planet's geographical features. What was discovered was that Venus, on a large scale, is quite flat. However, it has three distinct types of region. Venus has "highland" zones, covering only 10% of its surface. These are no more than 1.25 miles above the surface. Half the planet consists of "deposition plains", which are between zero and 1.25 miles above the surface. The rest of the planet consists of smooth "lowland" plains, generally below zero altitude. There is unusual volcanic activity all over the planet. Although normal volcanic activity is prevalent, there is also evidence of phenomena called "coronae". These are "pancake" volcanoes, where internal pressure has raised the surface in a sort of dome shape, which then collapses in the middle to create these strange features. The only other place in the solar system this feature has been discovered is on Uranus's moon, Miranda. 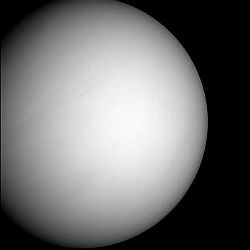 The planet Venus, named after the Roman goddess of love and beauty, in reality a world with a truly hostile environment.